We have been starting to hear from the Minnesota Department of Natural Resources that milfoil can be good for lakes. Over the past month, I have heard and seen in various media that milfoil may be good fish habitat, milfoil may help to keep suspended sediments out of lakes, and milfoil may help keep lakes clear. I have also heard that overly aggressive control may do more harm than good. There may be some truth to these statements in a very narrow context, but mostly milfoil is bad for lakes. The DNR is concerned about protecting the health and integrity of lakes – we all are. However, when these concerns are framed inappropriately, they may be misleading. While milfoil control is high on Lake Minnetonka’s radar screen and keeping the lake healthy is in everyone’s interest, I think it is time to step back and examine these concerns. The various statements from the DNR are true, but only in extreme cases. For example, milfoil is good fish habitat – but only when there are no other native plants in the lake. That is not the case in Lake Minnetonka. Lakes can become turbid and clouded with suspended sediment and algae, but this has only been observed in lakes where all plants have been removed, which has happened in only one or two lakes. That has not happened in Lake Minnetonka. Aggressive control, when it leads to total plant removal, can cause harm – again this has not happened in Lake Minnetonka. We have heard with respect to the Lake Minnetonka milfoil treatments that the yardstick being used to evaluate this project is that the treatments will not cause more harm than good. This is an appropriate standard, but I have not seen any assessment weighing the relative harm versus good in Lake Minnetonka. I believe the treatments on Lake Minnetonka have indeed been beneficial. 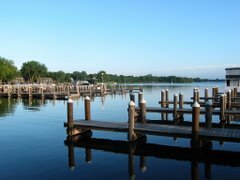 Lake Minnetonka contains a variety of native plants, which by themselves provide beneficial fish habitat. Milfoil diminishes the quality of that habitat. Therefore, removing it is beneficial – as long as we do not also remove native plants. Have we damaged native plants in this project? The proposed Gideon and St. Albans Bay treatments were denied because the treatments in 2009 appear to have damaged native plants, “though no tests of the possible statistical significance of the apparent trend were reported.” In Grays Bay in 2009, three species of pondweeds had declined, which is accurate. Several species increased too. As well, in Carmans Bay, one of these plants decreased and there was no treatment in 2009. However, there is no objective basis to conclude, as the DNR points out, that the treatments were the cause. Because we lack baseline information to indicate whether or not these plants normally increase and decrease in lakes without treatments, we do not know if the declines in some species are within normal ranges. There is evidence that the opposite may also be true. Milfoil growth, if unchecked, can cause harm to native plants in lakes. Eurasian watermilfoil began becoming problematic on Christmas Lake in about 2001. Since that time, the DNR conducted surveys and found an increase in milfoil and a corresponding decrease in about a dozen native plant species. Overall, the habitat quality has diminished in Christmas Lake as a result of advancing milfoil growth. Good versus harm ought to be weighed on this scale too – it may be harmful doing nothing. Milfoil is bad for lakes. While that does not mean we are compelled to treat it, if we desire to treat it, as we do in at least five bays on Lake Minnetonka, we should do so in a manner that is protective of the lake’s health and we should evaluate the relative benefits in the largest context possible.